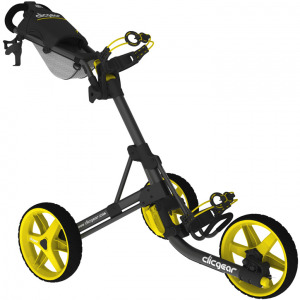 The Clicgear Golf Push Cart has redefined the compact push cart category. 2014 is the 8th year the Clicgear push cart has been in production. From the Best New Product Award at the 2007 PGA Merchandise Show, to the introduction of the Clicgear 3.0 cart in 2010, Clicgear continues to produce the best golf push cart in the industry. The new Clicgear 3.5+ Push Cart continues the evolution with improvements and updated colors. The Clicgear 3.5+ golf push cart is precisely engineered to be the world's smallest three wheel golf push cart when folded. The Clicgear folds to an amazing 23" X 15" X 13", small enough to fit into a storage locker, or corner of any vehicle trunk. That's up to 40% smaller than other three wheel carts! If you have any questions regarding the Clicgear 3.5+ Golf Push Cart, please give us a call, we would be happy to help you with any questions you may have. Write an online review on the Clicgear 3.5+ Golf Push Cart, and share your thoughts with others.